12" Mini-Ape Hanger Bars: The 12-inch Mini-Ape hanger bars on the Freewheeler® model are the tallest rise you can get from an OE manufacturer. They pull the hand controls back toward the rider, and reduce the force it takes to turn the front wheel for easy riding and easy handling. Bobtail Rear Fenders: The pair of Harley-Davidson® bobtail rear fenders gives the bike classic cruiser lines and styling details. Chrome Slash Cut Mufflers: The Milwaukee-Eight® 107 engine puts its exhaust note out to the world through these chrome slash down style pipes. Enforcer Cast Aluminum Wheels: There's an Enforcer front wheel leading the way, and you've got two more to match in the back. Up front, the brake rotors have been re-designed to show off more of the premium custom look of the wheels. 7-Piece Nacelle: A classic style chrome headlight nacelle that is tucked tight against the frame and forks for a tighter, smaller look. It also accommodates a clean-looking windshield mounting system. Unique Trunk System: It's a one-of-a-kind design that opens left to right (with one hand) and extends the entire length of the body for a clean look. Enough cargo space to easily accommodate two full-face helmets. Air Adjustable Rear Shocks: You can dial in your ride to accommodate heavier or lighter payloads, battle unexpected road conditions, or simply set it to how you like to roll. There's a convenient air valve for quick adjusting. Seat Height, Laden: 26.2 in. Seat Height, Unladen: 27.6 in. Rake (steering head) (deg): 26 deg. Oil Capacity (w/filter): 5.2 qt. Weight, As Shipped: 1,085 lb. Weight, In Running Order: 1,118 lb. Brakes, Caliper Type: 6 Piston fixed front with 4-31.75 mm front pistons and 2-25.4 mm linked rear pistons, 31.75 mm single piston floating rear deg. Lights (as per country regulation), Indicator Lamps: High beam, running lights, battery, neutral, low oil pressure, engine diagnostics, cruise control, security system (optional), gear indicator, low fuel warning, reverse, park brake, miles to empty. Rates starting at 3.99%* for new and 4.99%* for used Harley-Davidson® motorcycles with zero down options available. See your local dealer for details or Apply for Credit. 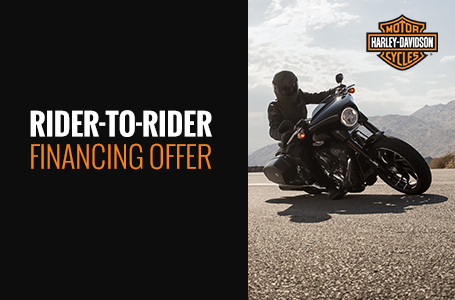 *Financing Offer available only on new and used Harley-Davidson® motorcycles financed through Eaglemark Savings Bank (ESB) and is subject to credit approval. Not all applicants will qualify. 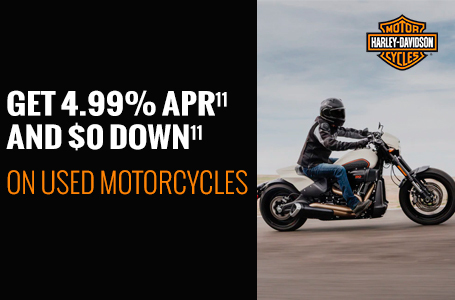 3.99% APR offer is available on new Harley-Davidson® motorcycles and 4.99% rate is available on used Harley-Davidson® motorcycles and only to high credit tier customers at ESB and only for up to a 60 month term. The APR may vary based on the applicant’s past credit performance and the term of the loan. For example, a 2018 Softail® Fat Boy® in Vivid Black with an MSRP of $18,999, no down payment and amount financed of $18,999, 60 month repayment term, and 3.99% APR results in monthly payments of $349.81. For example, a 2015 Softail® Deluxe model in Vivid Black with a sale price of $17,845, no down payment and amount financed of $17,845, 60 month repayment term, and 4.99% APR results in monthly payments of $336.68. In this example, customer is responsible for applicable taxes, title, licensing fees and any other fees or charges at the time of sale. APR is calculated according to the simple interest method. Not valid in conjunction with other offers. Other terms, conditions, and limitations may apply. Dealer participation may vary. Financing offer is subject to change or cancellation at anytime. See your Harley-Davidson® Dealership for details. No down payment*, reduced rates and flexible term options designed specifically for active duty military personnel. See your local dealer for details or Apply for Credit. 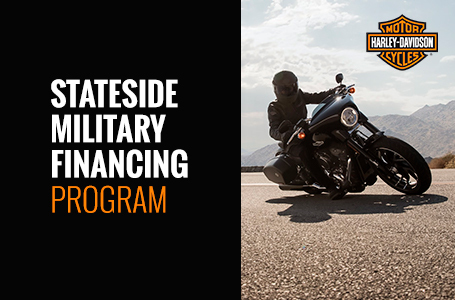 *Financing offer available only to Active United States Military personnel and only on Harley-Davidson® motorcycles financed through Eaglemark Savings Bank and is subject to credit approval. Not all applicants will qualify. No Money Down offer is available only to well-qualified credit tier applicants. 4.85% APR offer is available only to the highest credit tier applicants and only for up to 60 months term. The APR and down payment may vary based on the applicant’s past credit performance and the term of the loan. For example, a 2017 Street™ XG500 motorcycle in Superior Blue with an MSRP of $7,144, no down payment and amount financed of $7,144, 60 month repayment term and 4.85% APR results in monthly payments of $134.33. In this example, customer is responsible for applicable taxes, title, licensing fees and any other fees or charges at the time of sale. APR is calculated according to the simple interest method. Not valid in conjunction with other offers. Other terms, conditions and limitations may apply. Financing offer is subject to change or cancellation at anytime. See your Harley-Davidson® Dealership for details. Active Military includes: United States Army, Navy, Marine, Air Force, Coast Guard, National Guard and Reserves. Earn $150 in H-D™ Gift Cards + Low intro APR. 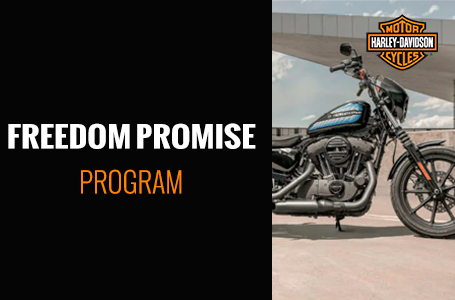 With the H-D™ Visa card, you’ll earn points for every eligible net purchase you make on the card. For every 2,500 points you earn, you can redeem for a $25 H-D™ Gift Card to spend at Harley® dealerships and h-d.com/store. Plus, earn a chance to win a bike each month in Free Ride Sweepstakes entries with double the entries if you're a H.O.G.® member. 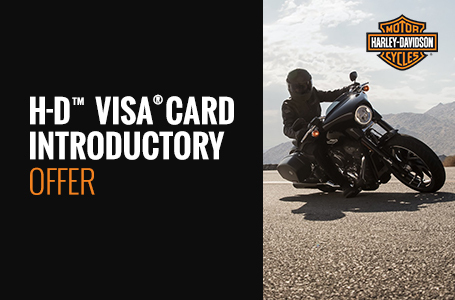 The creditor and issuer of the Harley-Davidson® Visa® card is U.S. Bank National Association, pursuant to a license from Visa U.S.A. Inc.
HDFS has specifically designed a financing program available on new and used Harley-Davidson Street® motorcycles. Rates start at 3.99% APR with No Down Payment* for 72 Months. See your local dealer for details or Apply for Credit. 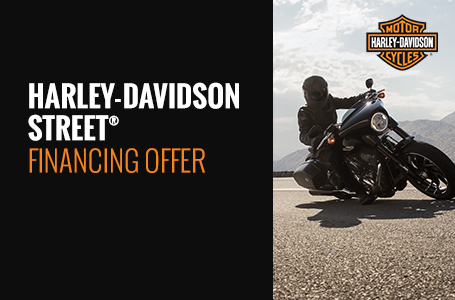 *Financing Offer available only on New Harley-Davidson Street® motorcycles financed through Eaglemark Savings Bank (ESB) and is subject to credit approval. Not all applicants will qualify. 3.99% APR offer is available only to high credit tier customers at ESB and only for up to a 72 month term. The APR may vary based on the applicant’s past credit performance and the term of the loan. For example, a 2018 Street™ XG500 motorcycle Vivid Black with an MSRP of $6,899, no down payment and amount financed of $6,899, 72 month repayment term, and 3.99% APR result in monthly payments of $107.90. In this example, customer is responsible for applicable taxes, title, licensing fees and any other fees or charges at the time of sale. APR is calculated according to the simple interest method. Not valid in conjunction with other offers. Other terms, conditions, and limitations may apply. Dealer participation may vary. Financing offer is subject to change or cancellation at anytime. See your Harley-Davidson® Dealership for details. Through the Harley-Davidson Rider-to-Rider Financing Program, financing is available to qualified individuals who are buying a used motorcycle from a private party. Your local participating Harley-Davidson® dealer can help you obtain financing and give you peace of mind knowing experts are involved in your sale. 2.99% APR AND $0 DOWN FOR 60 MOS. 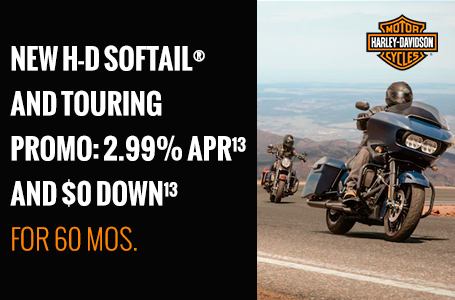 NEW H-D SOFTAIL® AND TOURING PROMO: 2.99% APR13 AND $0 DOWN13 FOR 60 MOS. Rates start at 2.99% APR13 for new H-D Softail® and Touring models with $0 down13 payment for 60 months. 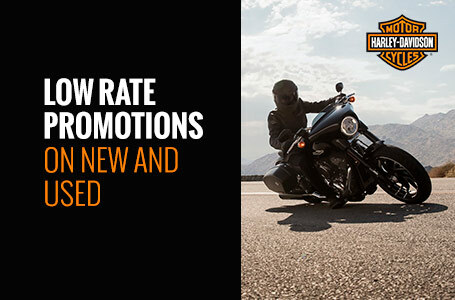 Rates start at 3.99% APR10 for new Harley-Davidson® motorcycles with $0 down10 options available. 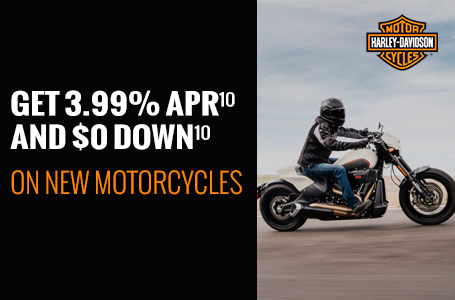 Rates start at 4.99% APR11 for Used Harley-Davidson® motorcycles with $0 down11 options available. The purchase price you pay on an eligible new or used Harley-Davidson Street® or Sportster® model is the money you get back when you trade in12 before August 31, 2020. 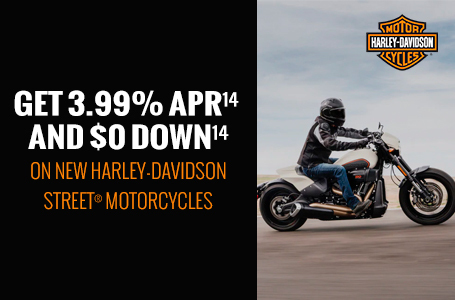 Rates start at 3.99% APR14 for new H-D Street™ models with $0 down payment14 for 72 months. Rates start at 4.99% APR15 for used H-D Street™ models with $0 down payment15 for 72 months. 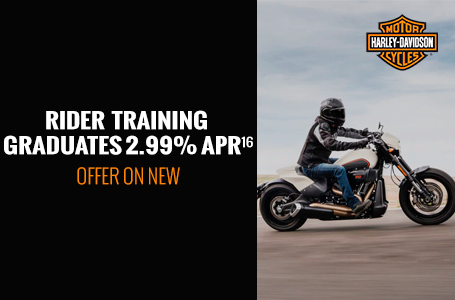 Complete the Harley-Davidson® Riding Academy Course or other approved accredited course and get rates as low as 2.99% APR16 on new motorcycles. You must apply within 180 days of course completion. Complete the Harley-Davidson® Riding Academy Course or other approved accredited course and get rates as low as 3.99% APR17 on used motorcycles. You must apply within 180 days of course completion.